As it concludes its January session, the Supreme Court is taking no action on cases involving the DACA program, leaving in place for at least several more months protections for 700,000 immigrants who came to the U.S. illegally as children. People participate in a protest in defense of the Deferred Action for Childhood Arrivals program or DACA in New York, NY, Sept. 9, 2017. The Trump administration asked the Supreme Court for an expedited review of the policy even before all lower court cases have been resolved. The justices, so far, have not decided to weigh in. If the justices do decide to take up the matter, the earliest it would be heard is in October, the court’s next session. A decision would not be expected until sometime in 2020. Meanwhile, in his shutdown standoff with congressional Democrats, Trump has proposed exchanging renewed DACA protections as part of a deal for border wall funding. The court’s inaction, however, may weaken some of his leverage by effectively protecting the program until at least the fall. 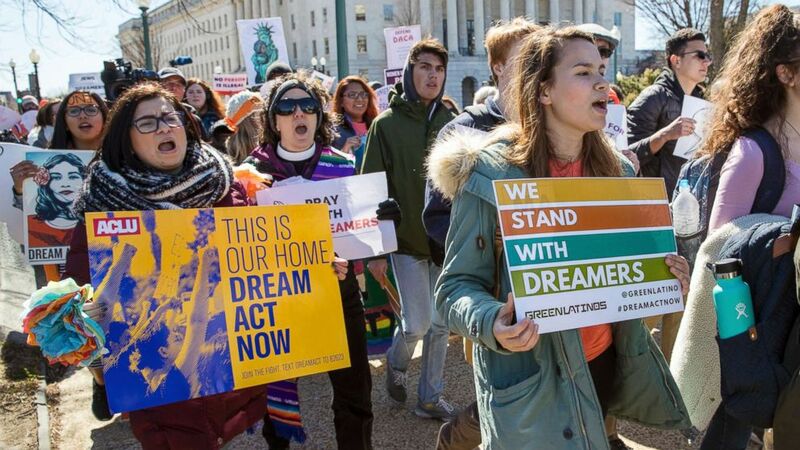 “There is no reason for the Court to consider these cases right now, on a rushed timeline, and before many lower courts have had a chance to consider the cases,” said Todd Schulte, president of FWD.us, a bipartisan immigrant advocacy group. Supporters of Deferred Action for Childhood Arrivals (DACA) hold signs during the Women’s March rally in Las Vegas, Jan. 21, 2018. The Supreme Court’s inaction on DACA means, in effect, that the program will remain in place through at least October. Roughly 700,000 immigrants, known as Dreamers, have received temporary protection from deportation and work permits under the policy. “DACA covers a class of immigrants whose presence, seemingly all agree, pose the least, if any, threat and allows them to sign up for honest labor on the condition of continued good behavior,” federal District Court Judge William Alsup wrote in his opinion last year blocking the administration’s move. The Justice Department declined to comment when reached by ABC News.